Blog What Is The Best Growing Medium For Hydroponics? When you think about plant cultivation, you probably visualize plants growing in nutrient-rich soil. But with hydroponics, you don’t use soil. Rather, the plants are fed by a water-based mineral nutrient solution. However, they still need a growing medium, that is, material to grow in, also known as the substrate. 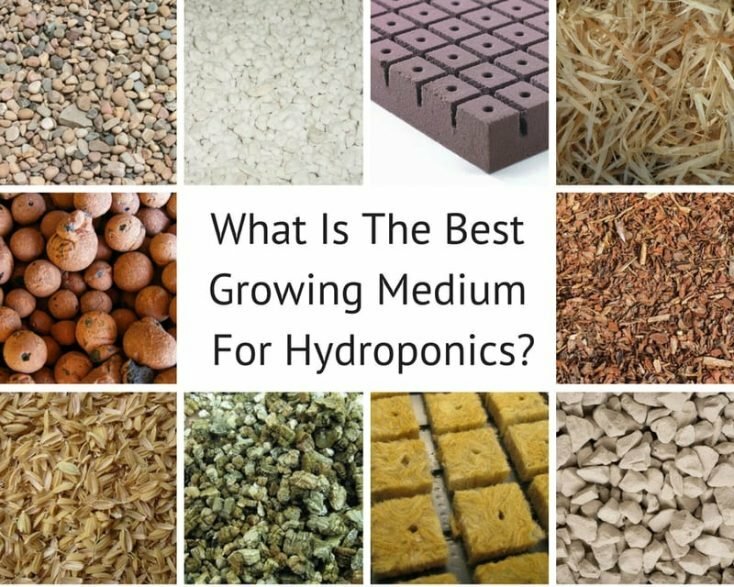 This article will explain all you need to know about choosing a growing medium for your hydroponics system. I will explain why some growing media are best suited to particular types of hydroponics systems, and explain the features of all the most common options. What Role Does The Growing Medium Play In Hydroponics? In addition to supporting the plant’s weight, the medium helps deliver moisture and oxygen to the root system and provides the plant with maximum exposure to the nutrients it needs. What Are The Advantages To Using A Growing Medium Other Than Soil? One major advantage is that it eliminates the threat of pests and diseases commonly found in soil. It also means you can grow produce in places where the soil is of poor quality – or doesn’t exist at all, like on patios, rooftops, and even indoors. Also, no weeds! And of course, it allows you to have total control of the growing environment, from the temperature to the moisture and oxygen levels to the nutrients. Best of all, your plants will grow faster and healthier when their roots don’t have to use up energy searching for the nutrients they need in soil. Many types of media can be used for growing plants. For example, you’re probably already familiar with peat moss. Growing media used in hydroponics include inorganic substances like sand, gravel, and growstones made of recycled glass, organic materials such as pine bark and coconut fiber, and even air. When you are choosing which medium to use for your hydroponic project, you’ll need to consider factors ranging from the types of plants you intend to grow to the costs and availability of the different media. However, the main factor will be the type of system you decide to build, along with its design. Even though the hydroponic systems and media you can use are all very different, the goal is always the same: you want the plant roots to have moisture, but not too much. If the medium is constantly saturated with water, the roots can suffocate from lack of oxygen, leading to root rot that will kill the plant. What Are The Main Forms Of Growing Media Used In Hydroponics? Hydroponics growing media can be categorized into three basic forms: grains and pebbles, foam matrix, and fibrous organic matter. Each form can be used for specific or for general purposes and may be particularly suited for a certain type of hydroponic growing system. In addition to these, you could also use lightweight pumice stone or gravel, following the suggestions mentioned for similar materials. While not yet in widespread use, sheep’s wool is gaining interest as a promising renewable fibrous organic hydroponic growing medium. Before getting to the list of growing media used for hydroponics, let’s take a quick look at the different hydroponic systems and what types of growing media they require. In water culture systems, where plants are suspended above a tank so their roots can grow directly in the nutrient-rich oxygenated water, you will only need a growing medium for starting your plants. You’ll want to choose a medium for your starter cubes or small growing baskets that provides some structure but doesn’t absorb too much moisture, such that only the bottom part gets wet while the top part remains dry. If the medium is allowed to become too moist, it can cause stem rot. Grow rock and rockwool are two media that are commonly used in water culture systems. Nutrient film technique (NFT), the most popular type of continuous-flow solution culture, is another system that only requires growing media for starting your plants, since the roots grow directly in the streaming solution. As with water culture systems, you need to make sure that only the bottom part of the start cube or basket medium becomes moist so as to avoid stem rot. Aeroponic systems also do not require a growing medium other than for starting seeds, cuttings, and transplants. Here again, you need to prevent stem rot by choosing a medium that doesn’t become absorb too much water as you feed the nutrients to the plant roots via mist. With no motors, pumps, or moving parts to deliver the nutrient solution to the plant roots, it’s essential to use a growing medium that is good at absorbing and holding moisture in wick systems. Lightweight, absorbent materials such as perlite and coco coir are among the more suitable media for these systems. For flood and drain systems, you should avoid buoyant media like perlite and vermiculite, as the moving water will simply wash it away. What you do need with these systems is good drainage. Unless you are growing plants that will be held to a trellis, such as peas, tomatoes, or melons, you should use a medium that will stay in place, be able to dry out between flooding, and maintain support for your plants. Grow rocks are a common choice for these systems because they provide drainage and don’t hold too much moisture. Another good option would be to lay river rocks at the bottom, underneath another medium such as coco chips that will hold enough moisture for the delivery of the nutrients to the roots during the draining stage. With good drainage, you can easily control moisture in drip systems. Here again, you can put a medium like river rocks at the bottom and use a substance such as pine shavings that can hold onto moisture for your plants. And now, here it is: an extensive (though not exhaustive) list of growing media used for hydroponic systems. 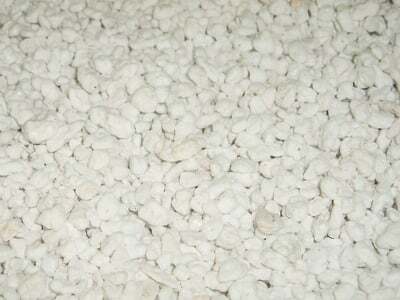 Lightweight Expanded Clay Aggregate (LECA) is a very popular hydroponics growing medium. 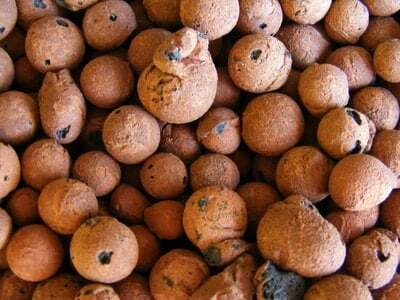 Also referred to as grow rock, clay pellets, and clay pebbles, as well as by various brand names, LECA substrate is made by firing round clay pellets in a way that causes the clay to expand like popcorn so they become porous and lightweight, yet still heavy enough to provide good support for your plants. It is a sterile, pH-neutral medium that doesn’t compact over time. It can be reused, although the process of cleaning and re-sterilizing it can become cumbersome at large scale. LECA is widely available from hydroponics suppliers. Made from recycled glass, growstones are somewhat similar to LECA. They, too, are reusable, along with being porous and lightweight. Growstones provide great aeration and moisture, with the capacity to wick water up to four inches above your Hydroponic system’s waterline. This means you need to be careful to ensure that the upper part of your growing medium is not continually wet, which can lead to stem rot. You can prevent this problem by either ensuring good drainage or making sure the growstones are placed deep enough that they don’t wick moisture all the way to the top. Perlite is a mineral that has been superheated so it expands into lightweight pebbles that are pH neutral, porous, and very absorbent. It is often mixed with other growing media to decrease water retention. Perlite can also be used by itself, although it’s not best suited for flood and drain system designs, since it’s so buoyant. You’ll need to be careful about getting perlite dust in your eyes when working with it. Before you start, wet it down to rinse it and prevent the dust from becoming airborne. You can easily find bagged perlite at gardening centers, as it’s often mixed into potting soils. But if you want to save some money, look for it at building suppliers who carry it as an additive for cement. Another type of expanded mineral, vermiculite is very similar to perlite, but with a higher cation-exchange capacity, allowing it to store unused minerals for release to the plants as needed at a later time. 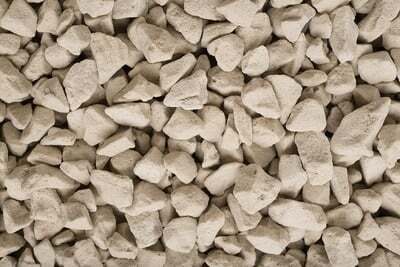 Like perlite, vermiculite is also used for other purposes. 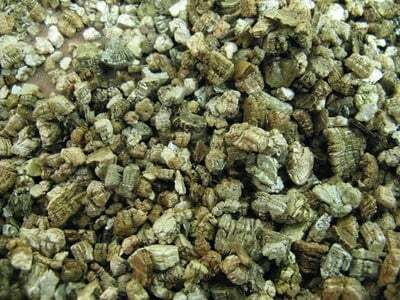 However, you should only purchase vermiculite that’s specified for horticultural use. Known alternatively as water crystal gel, water beads, and hydrogels, superabsorbent polymer (SAP) can absorb large amounts of liquid relative to its mass. SAP has many uses, ranging from disposable diapers to hot and cold therapy packs to large-scale flood control systems, in addition to its use in potting and other soils to help retain moisture. The beads are inexpensive and reusable, and they come in many sizes, with the larger sizes being best for use as a hydroponic growing medium. As mentioned before, larger size granules allow for more air space within the substrate that are necessary for aeration and root growth. This is especially important with water beads, since they expand and can become a gel-like mass. You can mix them with another granular medium to increase the oxygen supply for the plant roots. Although river rock can’t absorb water, it can still be used as a hydroponic growing medium. The uneven shapes allow the plant roots to grow in the spaces between the rocks as well as providing plenty of oxygen. You just have to make sure to supply water frequently enough that the roots don’t become too dry. Or, you could mix in another medium that does water to ensure adequate moisture for your plants. 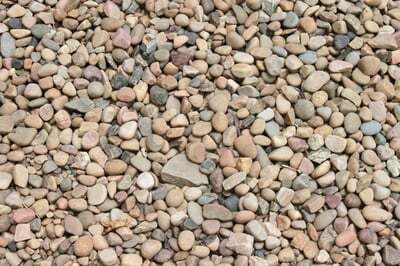 In fact, river rock is best used in combination with other media to aid with water drainage. It’s often placed at the bottom of the growing container to avoid saturation of your primary substrate material. Commonly available in many different sizes at home improvement outlets and aquarium supply stores, river rock can be quite inexpensive to buy. You could actually just use any ordinary rocks you find laying around, although they won’t have the smooth, rounded edges of real river rocks or rocks that have been tumbled in a machine to achieve the same results. You will need to clean and sanitize them first, though, by spraying off the dirt, soaking them in bleach, and rinsing. Another consideration may be the weight of the rocks. If you want to be able to move your Hydroponic system at a later date, or you are uncertain of the flooring capacity, then you’d best skip the rocks. Sand is another growing medium that may be inexpensive and easily available, yet could be too heavy. But as with river rocks, sand is often mixed with other media, particularly perlite, vermiculite, and coco coir, which will help with moisture retention and aeration. This will also help with the weight problem. When looking for sand to use as a Hydroponic growing medium, you want large grains rather than that lovely, fine-grained sand that’s found on the world’s most luxurious beaches. The larger size provides more pockets of air between the grains. 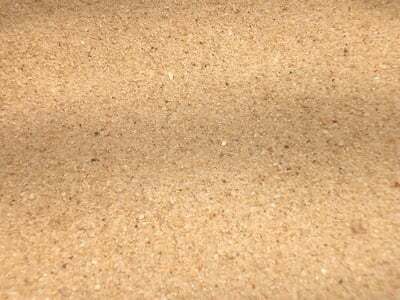 Before using your sand, you must rinse it to remove dust particles. You will also need to sterilize it between uses. One of the most widely used media in hydroponics, rockwool is a product made primarily from granite or limestone that’s been heated to a molten state then spun at high speed, resulting in an interwoven matrix of fine fibers. This medium is excellent for Hydroponics because it is sterile, non-degradable, and porous; it can hold a lot of water and air; and it provides a good structure to hold plants stable, making it a popular choice for starter cubes. Before using it to grow plants, rockwool needs to be conditioned to achieve the appropriate pH balance. 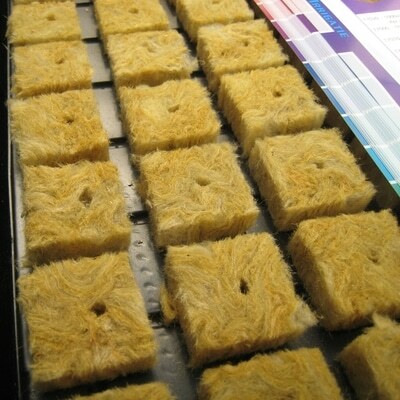 Oasis cubes are similar to rockwool, except that they are less prone to becoming waterlogged, as long as they are not in constant contact with water. 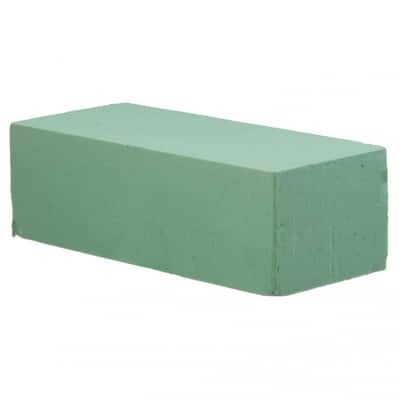 Like rockwool, this material is often used as starter cubes, although it can also be used as the growing medium for your entire hydroponic system. Oasis cubes resemble the foam that’s used to hold flower stems in floral displays. They absorb air and water, wicking moisture throughout the medium while allowing plant roots to grow through the material’s open-cell structure. 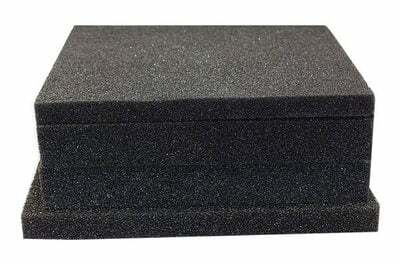 Yes, that floral foam mentioned earlier can also be used as a substrate for hydroponics. You’ve probably noticed that this material absorbs water well, if you’ve ever seen it used in flower displays. However, you will need to make sure it is not in constant contact with water, as it can easily become waterlogged. And also, be aware that it tends to crumble, so you will need to watch out for stray particles in your water supply. 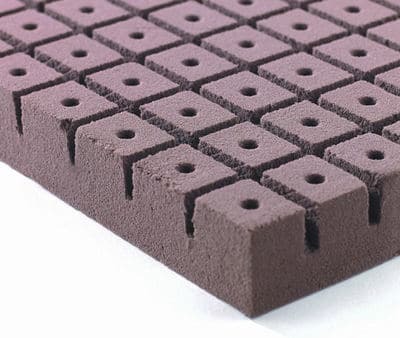 Another matrix-type substrate alternative is the low-density foam used for bedding and upholstery that’s known as open-cell flexible polyurethane foam (FPF). Widely available at fabric and hobby stores, FPF comes in rolls of various sizes and thicknesses, which you can easily cut either to fit a larger growing container or to make starter cubes. FPF is relatively new on the hydroponics scene. And although it is not something hydroponics suppliers usually carry, it’s being used by innovative growers looking for an inexpensive alternative to specialized matrix substrate like rockwool and oasis cubes. Coir is a fibrous material that comes from the husk of coconuts. While it is organic, coir decomposes so slowly that it doesn’t release any minerals to growing plants. It’s a perfect growing medium for hydroponics, since it is pH neutral, it holds moisture well, and it provides excellent aeration for plant roots. 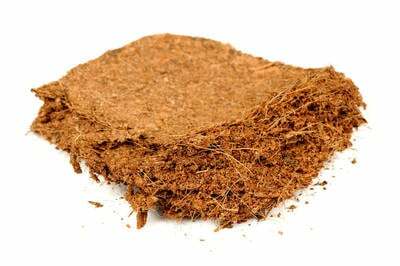 Coir is used in hydroponic in two different forms: coco fiber, which has a consistency similar to potting soil, and coco chips, which are more like small woodchips. Coco chips are the better option for plant baskets and for situations when you really need to make sure the roots are getting enough air. Both forms of coco coir are available in compressed bricks that will expand approximately six times the size when soaked in water. If you soak your coir in warm/hot water several times before using, it won’t color your hydroponic system’s water supply. 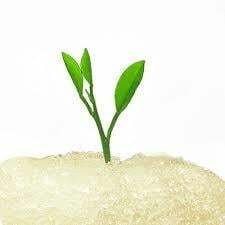 Like coco coir, parboiled rice husks (PRH) constitute an organic material that can be used as a substrate for hydroponics because it breaks down so slowly. After the rice has been milled, the husks are steamed and dried to kill contaminants such as bacteria, fungal spores, and decaying bugs that may be present. PRH has a pH range that is appropriate for most hydroponically grown plants. It is often mixed with another growing medium such as pine bark. 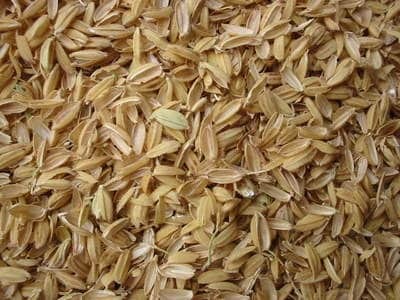 Rice husks may also be found in other forms, including fresh and composted, but these forms are generally not used for hydroponics due to the high probability of contaminants. Another concern is their high manganese content. However, manganese toxicity shouldn’t be a problem, provided that the material has a pH above 5, which is below the normal level for hydroponics. Pine bark was one of the very first substrates ever used in hydroponics. Pine is the preferred type of tree bark because it’s more resistant to decomposition and has fewer organic acids that could leach out than other barks. There are three types of pine bark: fresh, composted, and aged. If you use fresh pine bark, you will need to add extra nitrogen to your nutrient solution, since fresh pine bark uses up nitrogen as it begins to decompose. This problem can be avoided by using composted pine bark instead. Aged pine bark has more nitrogen than fresh but less than composed. 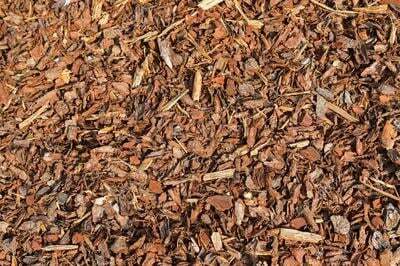 Once considered a useless waste product, pine bark has become widely used as mulch and as an appealing ground cover, as well as for hydroponics. You can easily find it in gardening and landscaping supply centers. 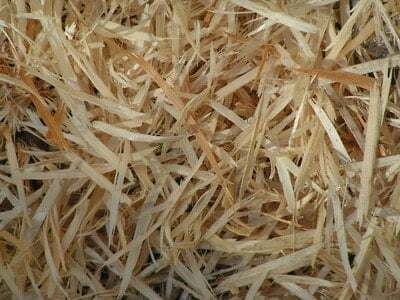 Pine shavings are another alternative that’s inexpensive and commonly available at pet and feed stores. It’s used to line hamster and rabbit cages as well as horse stalls. You just need to be careful to read any packaging to make sure there are no chemical odor inhibitors or fungicides. Also, it should be made from kiln-dried wood, which means the harmful sap has been burned off. Don’t be tempted to try using sawdust as a hydroponic medium, as this will become compacted when wet. Even when you’re using the largest size pine shavings available, you will need to be careful about the substrate becoming waterlogged. You could always lay river rock at the bottom of the container to ensure good drainage. How Long Do Watering Globes Last? Thanks for all the info! Very helpful and useful!